Infographic associated with August 2015 Vital signs: Making health care safer : stop spread of antibiotic resistance. 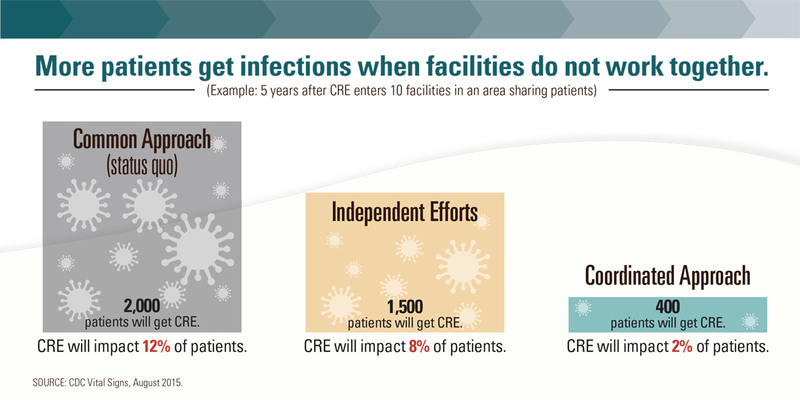 Graphic titled "More patients get infections when health care facilities do not work together." ◦ With the Common Approach (status quo), CRE will impact 12% of patients. 2,000 patients will get CRE. ◦ With Independent Efforts, CRE will impact 8% of patients. 1,500 patients will get CRE. ◦ With Coordinated Approach, CRE will impact 2% of patients. 400 patients will get CRE. On cover: Celebrating health care workers in northern Namibia : supporting an AIDS-free generation.